Product #365 | SKU DJPRE-2F | 0.0 (no ratings yet) Thanks for your rating! 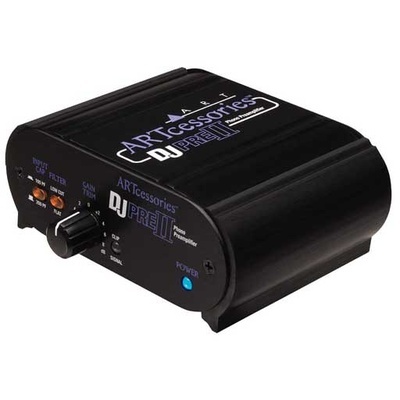 The DJ PRE II is a high quality phono preamp designed for your home and studio. It acts as an interface between your turntable and your audio recording system. The analog input capacitance can be switched between 100pf and 200pf to optimize your phono cartridge response. A switchable low cut filter removes rumble while leaving the audio pristine. The front gain trim control and signal/clip LED allow you to optimize the preamps gain for a wide range of input sources. The built-in low noise phono preamp circuitry is highly accurate and precisely conforms to the RIAA standard. The Line Output jacks are low impedance and can work with any sound card. Housed in an all aluminum black anodized case, the DJ PRE II can be powered by a wide variety of external supplies. If you need to amplify and EQ your vinyl records to interface with your audio workstation, sound card, or main monitor system, the DJ PRE II gives you flawless audio reproduction in a rugged and reliable package. Includes power adapter.